Mud and Fire Potters began long before our Little Meadows studio opened. In the early 1970's, Archie and Ruth began studying pottery at Pratt Institute in New York City. There they had the privilege of studying with renowned potters and were exposed to Asian, American and English pottery in the tradition of Hamada (a Japanese potter) and Bernard Leach (an English potter). 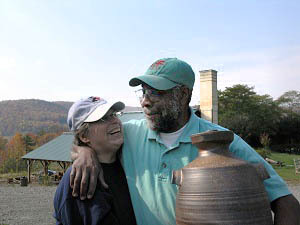 Almost forty years later, they continue to explore new styles, techniques and forms, and to thoroughly enjoy creating pottery. Archie was raised in Jamaica, and contributes Jamaican/African influences to our traditional and contemporary designs. He spent the first half of his professional life as an architect, a skill he used to design the studio and wood-fired kiln to his specifications. 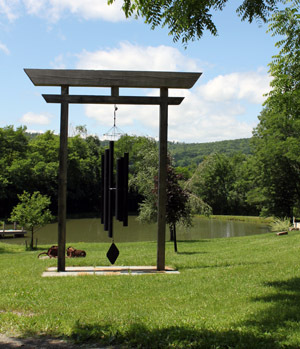 In his estimation, the muse provided by the natural setting of this studio surpasses that of the Brooklyn basement where he created pottery until 2003. Ruth was raised in New York City and spent the first half of her professional life as an educator and public school principal. She is also enjoying the opportunity to create pottery full-time while emersed in a beautiful rural setting -- she finally has adjusted to the drive required to get bananas! All of their work, both functional and decorative, is made from stoneware. Except for crafting sets such as bowls and mugs, they strive to make each piece individual and distinctive. Though most of the pots are thrown on the wheel, they combine altered wheel-thrown forms and hand-building to create a new fluidity and freedom in design. © Mud and Fire Potters. All Rights Reserved.